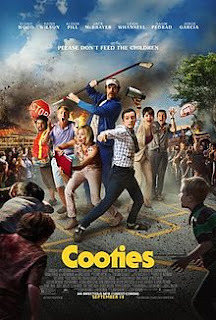 In the new horror-comedy COOTIES, a little girl eats a bad chicken nugget and turns into a zombie. Before long she’s infected some of her classmates, and all manner of undead hell breaks loose as the kids start trying to eat their teachers and other adults. It sounds like the sort of schlockfest you’d expect to find padding out the offerings on Netflix, but thanks to a recognizable cast and a screenplay by SAW writer/producer Leigh Whannell and Glee co-creator Ian Brennan, this one is actually getting a limited theatrical release. The faculty of the infected school includes Elijah Wood (the LORD OF THE RINGS trilogy) as a would-be Steven King forced to take on substitute work, Rainn Wilson (The Office) as a dim witted phys ed teacher, Alison Pill (The Newsroom) as Wilson’s girlfriend and potential love interest for Wood, co-writer Whannel as a teacher suffering from some kind of brain damage, and Jorge Garcia (Lost) as a bus driver tripping on shrooms amidst the mayhem. Also of note are Jack McBrayer (30 Rock) and Naseem Pedrad (Saturday Night Live). Maybe not A-list star power, but it’s certainly a more recognizable bunch than one usually finds in movies of this sort. Simply looking at the credits, one is tempted to hope that COOTIES might be something more than it appears. It’s not. An entirely by-the-numbers horror comedy, satisfying shocks and jokes are both few and far between, and the name actors bring nothing special to the proceedings. Well, maybe Wilson gets a little more comedy mileage out of his character than he has a right to, but that’s about it. It’s not that COOTIES is a terrible film. It’s just that beyond its cast, it never does anything to distinguish itself. You might as well just stay home and watch WOLFCOP or ZOMBEAVER instead of going to the trouble of putting on pants and leaving the house to see this in a theater. 2 out of 4 stars.